Smart watches are nothing new. Now the major force in digital industry Apple took its move toward timepieces and announced the newest Apple smart watch Series 4 designed for fitness and health. While staying on the sidelines, most users are wondering if Apple Watch Series 4 really deserves the hype. Well, what can Apple Watch Series 4 do, say, as just as Apple Watch Series 3? What Apple Watch Series 4 advantages outweigh various other smart watches on the market? Here we give a detailed introduction on the features and advantages of Apple Watch and the latest Series 4. The most stunning feature from the Apple Series 4 is the built-in electrical heart rate sensor. Now users can take an electrocardiogram (ECG), helping diagnose heart issue and detecting early signs of disease. Users will know if there is any sign of atrial fibrillation. It's worth noting that the ECG Functionality in Apple Watch Series 4 is limited to models sold in the United States. Other noticeable pros of the Apple Watch Series 4 include its larger screen size. The 40mm and 44mm models show extra screen real estate for apps with eight complications. But the bodies are thinner than previous Apple Watch models. The watch is highly praised as the most beautiful watch designed by Apple. The new watch comes with powerful CPU and GPU (a 64-bit dual-core processor and the next-generation S4), which makes the Series 4 perform two times faster. Improved accelerometer and gyroscope can sample motion data eight times faster. New WatchOS 5 is also a big advantage of the Apple Watch Series 4. Apple's watchOS 5 operating system will become available on Monday, September 17. It brings tons of new features and improvements, such as Walkie-Talkie mode, interactive notifications, better health tracking, WebKit support, and more. Though, we see the talk time when connected to iPhone increases by one hour, battery life of the Series 4 doesn't improve - it's the same 18 hours, the same as Series 3. Longer battery life we were expected to get from the new Apple watch didn't realize. As for the new heart health-monitoring features from Apple Watch Series 4, doctors aren't convinced yet. Apple Watch has built-in GPS, which is the first big Apple Watch advantage and helps track workouts without the need to take an iPhone. Apple Watch Series 4 is set for sports - water resistant up to 50 meters, making it can be worn while swimming or surfing. 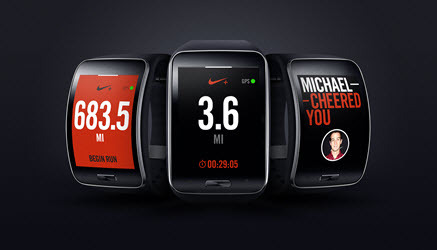 This a big advantages from Apple Watch over other Samsung Android smart watches . It boasts various common best apps for Apple Watch, including some free sports apps, with which wearers can access the Messages, Mail, Weather, Calendar, Maps, Passbook, Music. It's more like a tiny wrist computer, in a new and smaller way with the tiny watch face around 40mm. Another killer advantage of Apple Watch lies in the built-in microphone and a speaker, so wearers can interact with the watch by Siri as well as make and receive phone calls. In addition, the most popular augmented reality game Pokemon Go comes to Apple Watch Series. At the same time, watchOS is Apple Watch Series advantage which added a new Siri watch face, updated user interface in Workout app, added a new Music app to improve the AirPods experience, added a new Bluetooth-pairing features with smart devices including glucose monitors and smart tennis rackets, etc. Much of the focus has been on one of the simple and compelling Apple Watch features: a suite of fitness and health-oriented features. With a sensor that can track the steps and heart rate of the wearer, Apple Watch is able to show off the daily movements of the wearer, like walking, standing or exercising, and over time suggest customized exercises for the wearer. 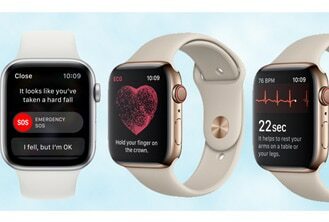 Besides, Apple advanced health apps with CareKit and ResearchKit in new Apple Event on Mar 21, 2016, finding a way to predict seizures with Apple Watch. This Apple Watch advantage is gaining popularity in a society where people care more about how to live a healthier life. The Digital Crown is without doubt among the killing advantages of Apple Watch that set it apart from other competing smart watches. A common problem with smart watches is that it's clumsy to control the tiny interface. Apple solve this problem brilliantly with a traditional feature of watches: the dial on the side of the watch, what Apple calls the Digital Crown. As one of the striking Apple Watch benefits, the Digital Crown allows wearers to correctly select interface icon and scroll through elements on the watch face. In Apple Watch Series 4, the Digital Crown offers haptic feedback. With three different Apple Watch categories, two face sizes and a collection of straps, a bevy of options are available. As remarked by an Apple fan, Apple is thinking for more than one type of customer. Obviously, everyone is gonna find their favorite from the 34 different Apple Watches models. In addition to Apple Watch, a pack of smart watches are available on the market. With so many hitting advantages of Apple Watch, it is believed that this Apple smart watch will catch up with dozens of Android Wear. So how Android Wear stacks up against with various benefits Apple Watch has to offer? Which one will wow your wist? Recent reports says that Google is getting its Android Wear smartwatch platform to work with the iPhone. 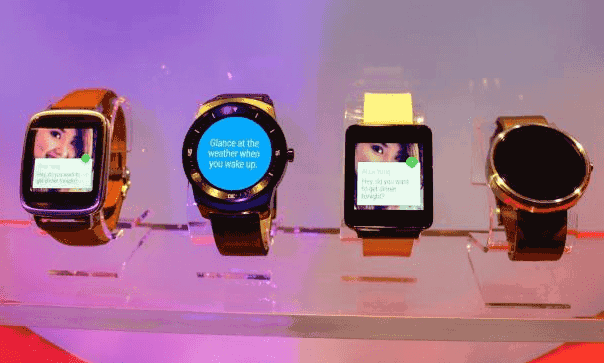 If Google develops an Android Wear app for iOS, will the Apple Watch advantages remain intact? To figure out that, below we list several leading competitors in the fight of Apple Watch vs Android Wear. Despite being one of the originally-released round Android watches, Moto 360 remains the most well-received smart watch so far, and thus becomes one of the most formidable rivals of Apple Watch. With the platform improvement, more features have been added and more color options are available. It's got all the advantages of Android Wear for the price of $250. It's not much of a looker, but the LG G Watch has two distinct advantages over other smart watches: good battery life and fully circular display. The LG G Watch R isn't cheap at a price of $300. To justify its price, it boasts a larger battery and a more watch-like design. Apple Watch vs Swiss Watch, which one to buy? 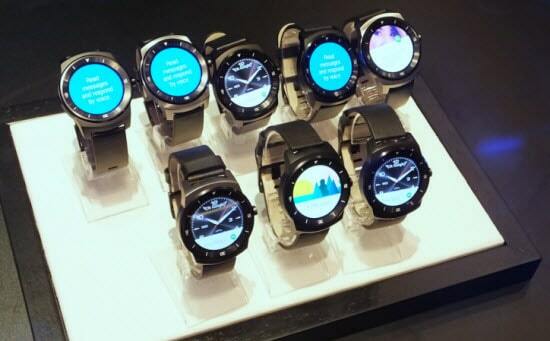 Samsung Gear S is also a good smart watch. Similar to some advantages of Apple Watch, Gear S is able to make and receive calls, send texts and receive messages, without a phone. However, with their own Tizen operating system, no Google apps are available. Combined with the super chunky design and price of $350, it may not be the top choice for some users. With so many advantages of Apple Watch (Series 4), to decide whether or not to spend your money, you'd better have a look at Apple Watch Series 4 shortcomings. As we mentioned above, Apple Watch Series 4 keeps the 18 hours of battery life, the same as Series 3, which is a downside from Apple Watch upgrade for some sports enthusiasts who ask for longer batterly life. How to improve Apple Watch battery life still remains to be one of the top concerns. Apple finally answer the question "How much will the Apple Watch cost?" And the Apple Watch's price is way higher than we were expecting to pay. Those days most of the chatter about this Apple smart watch revolves around the eye-wateringly expensive Apple Watch price. Well, the price for Apple Watch starts at $349 and goes up to $17,000. The differences in Apple Watch prices are down to the metal and glass of the watch. If its functionality lives up to its billing? With such an outrageously high price, even those dazzling Apple Watch advantages can hardly persuade users to buy one. Leaving aside the high Apple Watch price, another big problem with this Apple smart phone is that it's not a stand-alone devices. The watch can't be fully functional unless an iPhone is connected. This limits the benefits of Apple Watch that users can enjoy to a great extent. To put it another way, without an iPhone, you can only check the time. If you have already owned an iPhone, why you need an extra device, which bring rather limited functions compared with iPhone? Additionally, the 18-hour battery life as advertised is no significant improvement over other smart watches. There're more tips on how to improve iOS battery life.